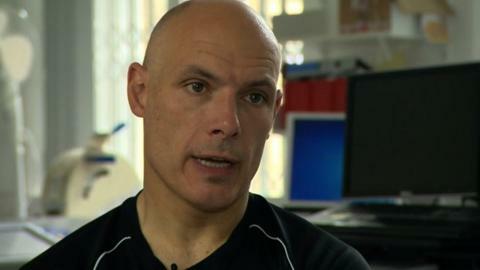 Howard Webb is bent double with pain and can barely stand up. Sweat pours from his chin, dripping down his arms and his legs. The 42-year-old referee gasps for air as the heat in this tiny room at Sheffield Hallam University's Faculty of Health and Wellbeing rises and the humidity spirals. We are 6,000 miles from the coast of Brazil but, in his mind, Webb is already at the World Cup as he pounds out mile after mile on the treadmill. "It is tough, it is very tough," he says. "The heat and humidity are going to be the biggest challenges in Brazil. We all know that." Webb leaves for Brazil in three days as England's sole refereeing representative. There have been no directives from Fifa, football's world governing body, to prepare for the conditions, but, for the past two weeks, Webb has reported to this temperature-controlled chamber and pushed himself to the limits of his physical fitness. "I want to be as prepared as I can," he says. "Coming to the chamber here gives me that chance. If it gives me a small advantage, if it means I can perform to my potential there, then why not do it?" The statistics make for startling reading. In Manaus, where England will play their first group game against Italy, humidity can reach 90% and temperatures can peak at around 33C. To put that into context, Webb burns around 2,200 calories during a Premier League match. In Brazil, that figure will jump to more than 3,000. The scientists at Sheffield Hallam believe Webb will sweat around 10 pints of fluid during every World Cup match he takes charge of and lose an incredible 1kg for every hour he spends on the field. Alan Ruddock, a sports scientist, is one of a number of experts driving Webb on, monitoring his fitness and creating situations for him to react to. While I am there, they yell the following to the Rotherham official: "Ronaldo is racing away on a counter attack, he is across the half way line, he gets to the edge of the penalty area and goes down. Is it a penalty?" It is nothing more than a game, but it focuses Webb's mind and reminds him why he is there and what he is doing this for. "Getting into the right place to make the right decision is key," he says. "It is so important to be physically and mentally fit enough to make a clear call even though you are having to work hard in difficult conditions." The idea of using the chamber first occurred to Webb this time last year. As he stepped out into the mid-afternoon heat of Fortaleza to referee the Confederations Cup match between Brazil and Mexico, alongside assistants Mike Malarky and Darren Cann, he was surprised by the intensity of the heat. "It was really quite oppressive," he recalls. "The games I did in Fortaleza were challenging, but they gave me a feeling for what it is going to be like. "But it also inspired me to come here and do the acclimatisation. It is going to be hot and humid. It will undoubtedly affect the players, too." Webb goes to Brazil knowing that, however good his performance is, he is unlikely to take charge of the World Cup final, having done so in 2010. "There is nothing written to say you can't do the final twice, but it would be most unusual for that to happen," he says. "South Africa was an amazing experience. I have lost count of the number of times I have relived those days, those weeks, those matches, including the final. "We are part of a very small group of people who have been fortunate enough to be involved in such an amazing occasion. I look back with satisfaction and pride." "We go to Brazil confident we can do as well at this tournament as we did at the last one," says Webb. "It is unlikely anyone will ever be appointed to a second final, but we will savour every moment." Spain won the last World Cup, beating Netherlands 1-0 in the final. But one of the big talking points was Webb's decision not to send off Holland's Nigel de Jong for a chest-high kick on Spain's Xabi Alonso. "I can sleep at night and I can think back to the reasons why I made the decision I did," says Webb. "Very rarely will I look back at a game and I think everything was perfect. Looking back at the game, there were one or two things that weren't right, but I made the decision." Webb could be in line to referee the opening match of the 2014 tournament, between Brazil and Croatia in Sao Paulo, on 12 June, but the Englishman will not discover which match he will officiate first until he arrives in Rio at the weekend. "We only get one game at a time," he says. "You need to deliver that and then that might open the door to a second game and beyond. There is no point looking further ahead." He says the pressure will be just as intense in Brazil - "the eyes of the world are on you" - but he is relishing the tournament. "These are really important games," he says. "Any World Cup is special, but for it to be in Brazil, a football-loving country where the nation will embrace the festivities, is really special."